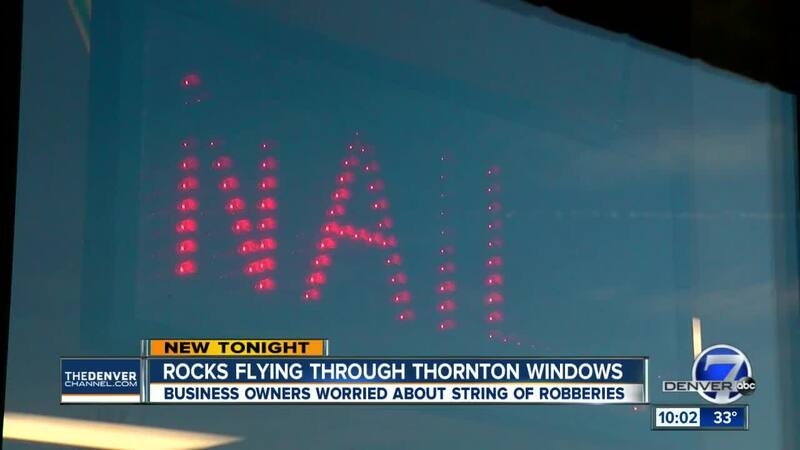 THORNTON, Colo. -- Business owners in two strip shopping centers are getting fed up with smash-and-grab thieves who have been hurling rocks through their windows. At least seven businesses have been targeted in the last month-and-a-half. Three in Woodglen Plaza, and one just down the block near 112th and Colorado, and three others in the Northridge Retail Center near 127th and Colorado. Saturday morning, customers, ordering delicious cakes and cookies at A Cake Occasion bakery, couldn't help but notice two large rocks on the window ledge, and two pieces of plywood in the window and door. "It was chilly this morning, because there were no windows there," said Danae Duran, the cake shop owner's niece. Duran said the cake shop has been family operated for 26 years and "never had a problem," until this morning. She said one of the rocks hurled through the window slid all the way through the shop to a case full of muffins. "They got away with the (cash register) drawer and four iPads," she said. "We used those iPads to take pictures of customer's cakes." A couple doors down, the owners of Marie's Taqueria and Sweets installed security cameras after experiencing a smash-and-grab burglary about a month-and-a-half ago. "We had to close for a couple of days," said Augustine Bautista, whose family owns the shop. "They took the cash register, which had about $150. That was the startup cash for the following day. They also took our business phone and some snacks." On Christmas Eve, thieves tried to burglarize Courtesy Cleaners, just two doors down from Maria's, but they didn't get in. The windows cracked but didn't collapse. It's been the same story at the Northridge Retail Center near 127th and Colorado. Thieves hit Slavinka Bakery overnight, shattering glass in one of the front doors. The shop closed early on Saturday. The doors, one covered with plywood, were chained shut and locked. On Christmas Eve, thieves targeted two other businesses in the same center. One of them was CQ Nails, the other Capri PIzza. "I just got a bill today for $400 for the glass door," said Capri's owner, Binod Khatiwada, "and the same amount just for the board." Khatiwada said thieves took his laptop, a digital camera and some change, about $50 or $60 in value. "For a small business, that's really bad," he said. "We work as a family. Sometimes it takes a week to make a thousand dollars." Thornton Police note there are similarities between the heists, but say they don't know yet whether they're all connected, or the work of copycats. Duran says the cash drawer and iPads stolen from the cake shop were recovered later in the day. She said she's hopeful that police will recover some fingerprints and will be able to link them to the thieves. In the meantime, she said, they too are planning to purchase security cameras. If you have any information about the break-ins, contact Thornton Police.